When tighter regulations were imposed on the banks after the Financial Crisis, the largest among them, the very ones that threatened to bring down the financial system, began squealing. Those voices are now being heard by Congress, which is considering deregulating the banks again. In particular, they claim that current capital requirements force banks to curtail their lending to businesses and consumers, and thus hurt the economy. Nonsense! That’s in essence what FDIC Vice Chairman Thomas Hoenig told Senate Banking Committee Chairman Mike Crapo and the committee’s senior Democrat, Sherrod Brown, in a letter dated Tuesday, according to Reuters. The senators are trying to find a compromise on bank deregulation. If banks wanted to increase lending, they could easily do so without lower capital requirements, Hoenig pointed out. Rather than blowing their income on share-buybacks or paying it out in form of dividends, banks could retain more of their income, thus adding it to regulatory capital. Capital absorbs the losses from bad loans. Higher capital levels make a bank more resilient during the next crisis. If there isn’t enough capital, the bank collapses and gets bailed out. But banks that increase their capital levels through retained earnings are stronger and can lend more. Alas, in the first quarter, the 10 largest bank holding companies in the US plowed over 100% of their earnings into share buybacks and dividends, he wrote. If they had retained more of their income, they could have boosted lending by $1 trillion. The CEO of the top bank on this list has been very vocal about plowing more of the bank’s income into share buybacks and dividends, while pushing regulators to lower capital requirements. “And we think it’s clear that banks can use more of their capital to finance the economy without sacrificing safety and soundness. Had they been less afraid of potential CCAR stress losses, banks probably would have been more aggressive in making some small business loans, lower rated middle market loans and near-prime mortgages. But the government was preventing them from doing it, he suggested. This didn’t sit well with Hoenig apparently. He was president of the Kansas City Fed and member of the Fed’s policy-setting Federal Open Market Committee (FOMC) from 1991 to 2011 – through the Financial Crisis. Observers of the Fed remember him wistfully as a one of the rare “hawks” on inflation. And, in his function at the FDIC, he’s not shy about being a thorn in the side of the biggest banks – though he is outclassed by the power of the biggest bank regulator, the Fed, which has a much more accommodating view of bank regulation. So Hoenig supplied some numbers in his letter. 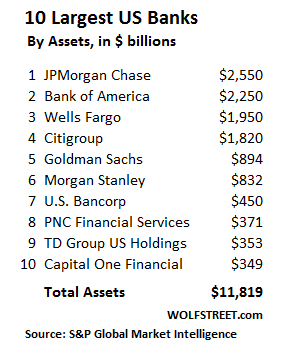 The largest bank on his list, JPMorgan Chase, earned $26 billion over the four quarters. But it plowed $27.6 billion – or 106% of its income – into share-buybacks and dividends. If it had retained that income, it would have raised its capital by that amount, and it would have been enough to make an additional $250 billion of loans under current capital rules. In total, the 10 largest banks combined, on an annualized basis, will plow 99% of their earnings into share-buybacks and dividends. Share-buybacks alone amount to $83 billion (not counting dividends). Under existing capital rules, if the banks were to retain this capital instead of buying their own shares with it, they could have increased commercial and consumer loans by $741 billion. And they could have still paid out their big dividends. If they cut their dividend payments some, they could have boosted their lending by over $1 trillion. “While distributing all of today’s income to shareholders may be received well in the short run, it can undermine their future returns and weaken the growth outlook for the larger economy,” he wrote. “I recognize that dividends are an important factor for investors and they should be rewarded for the risks they take. But it is also true that funding business growth, assuring future economic success, and promoting capitalism depend upon the retention of earnings,” he wrote. What is it that makes me think that his reasoning and pleas will once again fall on deaf ears? Is it the fact that banks, including Goldman Sachs, have aggressively schmoozed with Congress and staffed essential parts of the administration? Something tells me that Hoenig will be once again shunted to a sidetrack and forgotten. Time to break up the banks. We need to put Congress persons on notice to obey the Constitution and go back to Lawful Money or be tried for Treason. Buy gold and silver…..and take part of your “money” (those darn federal reserve notes you need to use at this time) and transfer your loans (refinance), them into and with a Credit Union instead of a bank. and because there is no law that requires an individual to pay income taxes, (or have a SS #) stop doing so… (there is a 20K reward if you can find that law!) starve them out forever. In theory corporations in general, and banks in particular, are allowed to be chartered on the expectation that it helps the country. In practice, they are chartered to help themselves. A lot of corporations should have their charters revoked because they are operated to violate their charters. It’s a broader problem. QE and interest rate management are essentially a money laundering system to get free printed cash out to Globalist patrons for their own uses. Unbelievable rises in asset prices are the transmission method. Stock buybacks enrich management via stock option schemes and the price bump in share price. This is the Globalist way of the world. Use Central Banks for capital. Use immigration for cheap labor. Export jobs for high margins. Put your people in high places to keep the agenda predictable. Don’t rob banks. Don’t own banks. Control a Central Bank for real money. Get your people in place who maybe actually believe the crap that motivates them to keep rates low forever and use printed money to buy debt and inflate asset prices. Others are pacified by feeling wealthier, but woe onto anyone who wants to actually take a profit — Reinvestment is fine but cashing out for personal benefit is offensive. The wall street industry has a million reasons why actually taking profits is bad. The real reasons – your cash out decreases fees from assets under management. Take control of the Central Bank, The Fed here, to put a stop to Globalism. Stop implementation of new age ‘theories’ that support low rates and endless QE and/or high balance sheet totals. Put people in place on the Boards who offer a traditional belief that interest rates represent the cost of capital and loans are financed by actual savings. Not free printed cash from Central Banks. This is the cure. cdr – that was a great post…I second that emotion! But I fear it is too late and there are too many who are clueless. The nation state is simply an incarnation of the robber baron in his castle extorting from traveling traders who needed to cross land he had occupied by force. All are obsolete in a world where billions can move across the planet in seconds. The modern day robber baron’s in congress and Parliaments, will not give up their obsolete nation state powers, so their states must be collapsed. The problem at the moment is what they get replaced with, on a planet past the p[point of long term sustainable population level. In progress people get hurt and the little people always get hurt the most, unless they protect themselves. Which is why, land, gold, and silve,r have been driven to untenable price levels, to make it harder for the little people to protect and keep what little they have (or in china simply put beyond the reach of most of them). Nation State “Socialism” is untenable, greece is one of the prime examples of a peacefully Socialist nation state in Collapse. Venezuela an aggressive Socialist dictatorship in Collapse. The first concern of the nation state administration, Nepostically ensuring, its own, well-being, grow, and longevity. My same belief. History repeats. Today’s Globalists are yesterday’s robber barons. No difference except in implementation. FYI, this is also my way to understand the gimmicks and frauds of today. Nothing is new. It’s only presented differently. The underlying concepts never change. Some of what happens in big and/or international finance today is identical in concept to a simply bar-room scam for drinks or pocket change. Amazon has books on everyday scams. Read one. Only the scale and a few tools are different in many. But you nailed it. Globalism today == Robber Barons of yesteryear. The globalists putting their people in high places for support has been done for centuries. Look at Chicago today for another more current example. Probably a good debate would be did Obama help out by pushing the Globalist model to work more like the Chicago model, since that’s his old stomping ground? Who has the guts to impose legislation that CEO compensation cannot exceed 100x the lowest page employee ? What has this got to do with this article? Everything. CEO compensation is the worst incestuous cycle America endures. So rather than invest in workers CEOs either slash jobs and replace them with workers overseas or borrow money to buy back their own companies shares – a practice which should be outlawed btw. Now if CEO compensation was capped they would have no incentive to engage in these practices. Only if and when Americans really that corporate CEOs who did not build their company are a cancer to this country is there a chance that this country will survive. Russia, Korea etc. are just noise from the military industrial complex. I want to be clear that hard working folks who build their companies as CEOs aren’t the scrooges. It is the MBA class who get into the job and give politically correct speeches while screwing everyone over who are the cancer. These vile folks ingratiate themselves with both parties and employ lobbyists to create laws for themselves. And they will cause the fall of this republic. This country is armed to the teeth and the dollar would only remain strong for a little while more. Ever wonder what folks would do when they can’t get anything? Maybe some socialism wouldn’t hurt? In communist China CEO’s get lynched occasionally. In china the little people are a consumable resource. Never forget that when considering CCP china. Your mba class should be convicted of high treason and given the appropiate punishment. They have enriched themselves by destroying your industrial base, undermining your education system, voiding your economy, poisoning your rivers and pumping bubbles everywhere. Future history books will teach how the cronies and their pets (journalists, economists, politicians…) sold their country in a short term hit and run, and in the process shifted the center of the power from west to east. I doubt that state-mandated history books will get any better. In the 90s when I was in high school, my AP History book had a brief section on Stalin and Russia. Did not mention the famines he caused. Also did not mention how Russia went from mostly third-world with low literacy to first-world and a super-power with an industrial economy in two generations. America’s schoolbooks are mostly all from just a few publishers, based in New England. They human and global ecological cost of that, are horrendous. Start with the destruction of they Aral sea and the creation of the most polluted and toxic industrial regions on the planet, and work from there. http://www.reddit/r/socialism is a good place to look into this. “The Americans will do the right thing, after they have tried everything else” – Winston Churchill. All true, but you don’t have a pair of presidential cufflinks, do you? The stock market and stockholders, pension funds, etc., and Politians are their ‘bestest friends’, not you, not me. We always cheer on the winners and boo the losers….look at Amazon vs. Sears. So who is going to do anything about any of this? No one, and they know that. Only when the sun gets closer to the earth is their even a whiff of a chance of change. The guy that runs United Healthcare makes $247,000 A DAY. Does that make anybody feel better? Makes me sick. Single payer. Like the rest of the developed world. Yea. I sure want a bunch of bureaucrats (sort of like the DMV) making my medical decisions for me. I’m sure those unaccountable government union employees will make better decisions than I do. Maybe the medical care will be as good as that provided by the VA.
And it’ll be cheap, too: you can’t sue the government for malpractice. Chip, I have no idea what your problem is with the people at the DMV. Last and only time I was at the DMV was 12 years ago to get my license when we moved here. Everything else since then, including car registrations, renewals, etc., has been done online. Its a breeze. Very efficient. Like a government is supposed to be run. What state do you live in where you have trouble with your DMV? Florida. The people at the DMV were great. If I had wanted to I could have ordered an appointment online. EXCEPT….the stupid state politicians made it more difficult to re-new…requiring original birth certificate and proof of residency. I was born in London and my folks actually had my American Naturalization form. They offered a one-time online renewal so I used that option because I didn’t want to bother. Except my photo is the photo on my old license which is 10 years old when I had a beard. So it barely looks anything like me now. So a time or two I’ve had some hassle from TSA taking an airplane…but I guess not lately because I have too much gray hair to look like a problem. The medical decisions are made by doctors who are NOT gov employees. It is the insurance that is state funded. It is the US in the grip of bureaucrats, the insurance company bureaucrats, who are skimming a huge chunk of the budget without contributing anything. The young and fit will someday not be. We are all in the same boat, the human condition. There are natural monopolies, where it makes no sense to have multiple private players. e.g. highways, which are built by private companies and paid usually by a single gov payer. The antidote for ideology, or the proof of the pudding is the result. Canada covers everyone for most stuff at about half the cost of the US. Note: out of millions of people there will obviously be exceptions that prove the rule. If you are rich or are willingly to bankrupt yourself for medical care no doubt the US will be an option for unusual conditions. Do you think he is rooting for a single payer system for healthcare? And the year before ACL ( obamacare) he made 14,000 a day. So what is wrong with a system that can’t be fixed? Now to be fair, this isn’t his take-home pay. Some of it is diverted to buy political power to directly support this scammy system. Some of it is spent on the wast propaganda apparatus to brainwash the brainless that he deserves more. The political contributions come from the company, although he probably contributes personally. Total income for CEO of UnitedHealth Group, Stephen Hemsley in 2016 was just a bit under $31.3 million. Political contributions NEVER come from the company; they ALWAYS come from (are extorted from) the shareholders. What do you suggest is done about it? Legislating salaries? There is no free market in health care anyway. The minute the insurance industry got involved it became a cartel industry. 1. Wealthy individuals themselves who are just fine with the monopoly power, so why would they rock the boat. 2. Institutional shareholders like pension funds who spend other people’s money. If the pensioners knew where their pension is invested in, and if and how their representative voted, they might revolt. So the system goes merrily on until it’s hits the iceberg. Part of the problem is most shareholders have absolutely zero idea of what a CEO should be paid. If you think you’re going to get a qualified CEO for a complex business for $500,000/year – good luck with that. Another part of the the problem is the vast majority of CEO pay actually results from shares vesting. The share value at grant time may be fairly small, but by vesting time, it’s huge. This problem will exist until someone comes up with a way to accurately forecast share prices 5 years ahead of time (good luck with that one, too). Shareholders might consider a “not to exceed” salary structure, but that might also inspire “not to exceed” CEO performance. I’ve been saying the same thing for years, but people freak out when you mention it. I’d actually place the cap at 40-50 times average salary. But the idea is more important than the specific threshold. One man doesn’t do the labor of 300 men and it’s ridiculous to even entertain the idea. The only reason we left these levels in the 20th century is because of the transportation and communication technologies that allow owners to live far away from those who would lynch them. This may surprise you, but CEOs who create tens-hundreds of billions of value (market cap) for shareholders, don’t perform the same “labor” as “average salary” workers. Theoretically, all employees should be contributing some economic value to the enterprise. The “average salary” worker may only contribute 150% of his/her salary. Viewed this way, a CEO who’s ideas/leadership produce tens/hundreds of billions in shareholder value (market cap) absolutely can (and does) produce far more value than 300 times the “average” worker. The few people who can do this generally will not work for 50x average pay, or about $2,500,000 (assuming $50k avg salary). Chip, are you a CEO? How did great American companies work in the 1980s and earlier when CEO pay was not > 100X average worker pay? I am afraid, your argument is not valid. As to Idaho Potato – India is no one’s example of a great country. I fear America will turn like India eventually except that the Indians historically have ruled by scaring people with God and different religions. Americans don’t have much of a religion and are armed to the tooth. Also if people have stayed in poverty for ever (like India), any uplift signifies betterment. On the contrary any decline from a high level (As in America) would be deemed catastrophic. These changes happen bit by bit. And one fine day you have a civic revolt. Not by the way, the MBA (as in Japan) is almost non-existent. The oldest degree (Heidelberg) dates only from 1995 and was strictly a reaction to international student demand, not industry demand. In the Japanese business classic “The Mind of the Strategist’ the author suggests that the concept of learning business in general and then entering the management of an actual business is difficult to translate. In his book ‘Boomerang’, Micheal Lewis describes German outrage at a CEO banker who loaded up on US subprime mortgages, being naive enough to believe Moody’s AAA rating. He narrowly escaped jail and had to return his salary of eight hundred THOUSAND dollars. Sorry about caps, in book it’s italics. The point of course is that this salary for CEO of a large bank would be laughable in the US. TA, it could get a lot worse. Indian CEOs makes 1200% median employee pay. Japanese CEOs, on the other hand, make 67 time the average pay of workers. They run profitable companies making high-quality products. I assume you meant 1200x median pay. Sorry. I meant 1200x median pay. This is because inequality in India is off the charts compared to anywhere in the Western world. Check percent with access to running water and toilets. Our rich one percent is their one percent of one percent. With a sizable segment earning by our standards, practically nothing, it is not surprising that a CEO is a thousand times better paid. Indian CEO’s are but one beneficiary of the labor arbitrage conveniently cloaked in the name globalization. OBTW, we can all thank globalization (enabled by financial engineering) for destroying fragile wildlife habit in “underdeveloped” countries. Then we can squeal about replacing the fossil fuels for which demand has skyrocketed as a result of developing those underdeveloped countries. Nobody’s considering the big picture of how smart money runs their scam, stocks aren’t bought they are sold.. The MBA class has destroyed business in this country by focusing only on short term profits and ruthless greed. They have already destroyed our Republic. The money men rule all. Don’t forget the professional politicians who have held the Money Men’s coats since 1913. And the masses should point a finger in the mirror…I’m a multi-generational Joe Six-pack blue collar guy who fought and clawed his way up (late bloomer)…sat in a lot of board rooms did a lot of consulting in my 50’s & most of my 60’s…but until exposure at the higher end of the business food chain had no idea (or was taught – yea we all thought the FED was part of the Federal government) what has gone on with the Banksters/Government…many attempts to explain it just earn glazed eyes. True, Mark. The government with the money men have been manipulating our economy for many, many years. Trying to Explain the Fed indeed causes much confusion among the general public. Much as I dislike the banks for what has happened, on one hand they are being told to de-risk their balance sheet post 2008 and on the other hand they are being told they could have potentially lent out another 1 trillion dollars in loans. Aside of the dividends, I agree that the share buybacks are a sensible thing to do. Everybody acknowledges that de-risking the balance sheet and new loans have to meet in the middle. The article makes the point that share buy backs take money straight out while Jamie Dimon complains loudly about not being able to lend because if regs. Maybe de-risk their balance sheet by cutting down on their derivative exposure and other high-risk activities that have nothing to do with traditional banking? Hoenig’s point: banks are clamoring for lower capital requirements, claiming that they would lend more if they had lower capital requirements. Hoenig is saying that they could stop share buybacks and lend more. I’m actually not sure that banks need to lend more aggressively (they’re already doing it – see subprime), and Hoenig wasn’t making that point. Yes, high-risk derivative exposure is not traditional banking. As I commented 20 July on “Did City of London Just Press the Panic Button” the OCC reported that Citigroup held $54.8 Trillion of derivatives on 31 March 2017. I wonder what Thomas Hoenig thinks about Citigroup’s success in having Congress revise the Dodd-Frank rule about betting on derivatives in the 2014 CRomnibus Bill. Now, by holding derivatives inside their depository units, Citigroup and other Wall Street firms such as JPMorgan Chase, benefit from an implicit FDIC guarantee for its counter-parties should those units fail. The other option to share buybacks (which I hate) is to park the money at. The FED. Which is counter productive also. The facts are ther are no good investments (Loans) for that money. Dimon in particular has no interest in a lending drive that is merely going to increase his NPL ledger. Hoeing seems to be from the build build build drill drill drill clan, no matter that there is no solvent buyer for what is built or drilled up. Just like The FED. Dimon is reducing the assets from QE on his balance sheet, in a different way. Also are some of the banks buying back selectively IE reducing shareholdings of some minority controllers??? It can be effective to overpay for stock held by some shareholders in these situations, when it can smooth things at the boardroom table in the future. Banks aren’t lending more because the demand side is weak, and the demand side is weak because it is systematically suppressed by the rentier class whenever possible. Since they have done away with the ‘virtuous cycle’ their path to profits cannot lie in productive investment but instead in asset inflation and liquidation of the real economy. So that is the path they pursue, destructive as it is to the general population. They have no real incentive to do otherwise, don’t want any, and won’t get any because they have a lock on all the levers. Good call reference cutting down on derivative exposure etc etc. The question which I don’t know is what’s more financially beneficial to a bank – a share buyback or cutting their derivative exposure? Why more lending is considered an economic benefit in and of itself is not explained. Stock exchanges, venture capital firms and private investors provide the risk capital entrepreneurs need not banks. Consumer finance for mortgages and car loans seem to be more than adequate. The problem, if there is even a problem, seems to be we are lending too much money to businesses and individuals who are not credit worthy. The focus was on capital requirements and share-buybacks. The banks are using lending as pretext to get Congress to lower capital requirements. Since banks create 97% of our money it probably is pretty important that they keep lending it. Which banks loan it , how much is loaned and who it is loaned to are very important. Sparkhassen, Landis banks in Germany , public banks in North Dakota, China , India all have different Charters. Today the need for these Mega Banks is non existent. We should at the very least break them up. Claw backs of this obscene bonuses and jail time for the financial terrorism they have inflicted on the masses for the last few decades would be nice. The big banks should be broken up because of the systemic risk they impose on the financial system. If you go back to the LTCM disaster that almost killed the economy, you will see that LTCM was able to borrow large amounts from every bank and broker without the others knowing, or wanting to know, how much exposure LTCM had taken on. This was possible because of deregulation. Had the banks been smaller, their exposure would have been smaller in total. In order to borrow one large pool of money, LTCM would have needed to borrow from a syndicate of banks, then they all would have know the exposure. LTCM was able to borrow 25 to 1 because of the opacity in the system. The banks want to keep that opacity and they also want to keep the financial system fragile, because then they are guaranteed a taxpayer bailout. Do you think Glass-Steagall would have prevented this? And what are the chances they re-introduce a similar bill? Glass Steagall would not have affected a hedge fund, they don’t take deposits are barely regulated, and are funded by wealthy investors only. Only a law limiting the market share of a bank to some small percentage could have stopped it, by limiting their exposure per customer. I don’t think Glass Steagall is coming back. The financial parasites benefit from the complexity, and so does congress. A derivative clearing house is probably a good idea to measure total exposure, but I think the last thing they want is to see the total exposure. I may belong in the shallow end of this blogs pool…but these two sentences of your post rang true to me. What I wonder about when reading this piece and the comments and all the other fine pieces of intelligent thought on this site is Is there any demand for lending that is currently NOT met? From autos to CRE to extremely high house prices and funding PE take overs and….. it seems to me that there is more leverage (debt) out there than can already be serviced. Much of the huge piles of debt were not done with intelligence. Most seem to have been done with the idea that some bank or bank like institution was going to make a huge pile of money creating it and that they had plenty of dumb buyers.. And we are all waiting for the other shoe to drop on the existing Ponzi debt that has already been created. So now some want to de-regulate the lenders so they can make even riskier debt? And just like last time, I’m sure there are really dumb but somewhat greedy pension fund managers who would buy it up for another 50 bp increase in hopeful income… hoping for a little bigger y/e bonus.. Unable/unwilling to see the big picture! That’s why you have crap like “Merchant Cash Advance” being as prevalent as it is. It’s just about as usurious as payday loans. When we hit bottom, I think our credit rating was in the low 400’s down from the high 700’s. What stopped us from borrowing wasn’t our bad credit rating, it was our low income. At every point there were people willing to lend for a price. We had a 25% car loan and a 30% credit card along the way. We were also able to rent and buy insurance. What we did was basically to plug into a system that had already existed for the poor and immigrant populations. The new high number of the newly poor only expanded these businesses. Some times these business compete with main stream businesses and sometimes they are part of those businesses. Those of you who comment here and speak about the poor decisions poor people make have no idea to what extent the poor subsidize the rich. With the help of our lawmakers, of course. Choosing to subsidize the rich sounds like a poor decision to me, eh? These are the moronic comments I was alluding to. Yes, the poor chose to subsidize the rich because they have no other choice. If our government gave a crap about the poor in the first place, there would be a law against usury. Then why did so many poor rural people vote for a rich NY RE investor? It’s a collective failure of people to act in their own self interest. So much of this reminds me of the “Hunger Games”! Side story – I have seen the Payday loan industry close up as a Loss Prevention Consultant. I had a booth at one of their state conventions (offering physical security & employee theft programs). All owners in attendance. Went to the bathroom and someone stole my display manuals. Now, there is a smile. Oh but hey … lets once again deregulate the banks …. cause thats worked out so well in the past … e.g. 1929 , 1973-74 ,1987 , 1993 , 2000 , 2008 etc – et al – ad nauseam ..
… cause of course the market place is the cure for all our ills… such as our foolish need to eat .. our silly desire for shelter … our unfounded wish for a better life for future generations … our desperate need for education etc ..
Not just banks. Look at a company like Corning (GLW). Debt of >3 bn. Instead of paying it off, they plan to raise another $20bn to buy back $10 bn of shares up to 2019 and another $10 bn to grow the business. That’s how they goose earnings per share. Short-sighted shareholders love it. Look at IBM earnings over the past couple of years. Mostly goosed through buybacks. SInce 2015, stocks and ETFS have seen a negative flow from retailers and institutions (-187 bn$) and a positive flow of 2tn$ from buybacks. The party is coming to an end with companies beginning to scale down the buybacks. Never let the details get in the way of illusions. I don’t know what’s worse, that the banks are caught up in the same share buyback frenzy that’s swept through the rest of Corporate America, or that our banks are still probably in better condition than Europe, Japan, or China. The Wall St monopoly doesn’t want competition. SB takes money away from franchise companies listed on the NYSE. It’s the grand illusion, that somehow the vetting process of getting listed on the stock exchange is preferable, and a larger stock float means that the company is ownable for pension funds and institutions. The net effect is that new business must be born and profitable and scalable in the shortest period of time. The mass market in things works against technological innovation. New companies are bought and trashed in order to remove competition, so your children will have Windows 99. The workaround is dark pools and venture capital which as we know can be a conduit to misdirect funds for political gain, and probably the CIA in Syria. Trump is such a dweeb he thinks he can stop the CIA with an order, and stop China’s illegal dumping with a trade war. It’s not capitalism any more, it’s not even Trumps version of gangster capitalism. Some time ago the military was the future source of peaceful technology, now its probably backwards because procuring for the MIC requires the Wall St version of franchise America to provide a great many uniform products. Buybacks and dividend payouts, just more wealth transfer. More lending to add to the already massive debt pool. Each sector taken individually seems a subject of concern. However you cannot view today’s total consumer debt as such. The sum of the whole is much, much bigger than the individual parts and when viewed as such is horrifyingly frightening. In one word – DERIVATIVES. The debts have all been mixed and intertwined, into an interwoven ball of confused risk. Not a question of “IF” this ball explodes, it’s a question of “WHEN”. I think all of the things you list are being supported by government spending. Student loans by research money paid to universities. CC debt by EBT, a shadow consumer credit lending program, not sure how many people use both? I pay my teenagers rent, he has money for a new car. The controversial Reverse Mortgage program has been superceded by banks extending Equity lines of Credit on your home. I get more offers for ELOC than I get for CC. The issue of derivatives takes one of two forms, interest rates, and fx. About half of all interest rate derivatives are registered, and almost none of the fx. Derivatives are the glue in the global economy. The business cycle has been abolished, these are matters of economics between sovereign entities and the BIS, the IMF, using SDR and CBs on speed dial. Its a lot larger than Joe BBQ has too much stuff. How can you lump dividends and share buybacks into the same bucket as “blowing earnings?” Share buybacks are mostly financial engineering to prop up performance on a per share basis to help overpaid and underperforming CEOs and their cronies meet their bonus incentive targets. Dividends paid at a reasonable ratio of earnings that allows enough allocation for capital expenditures and debt reduction, fairly rewards all existing investors. I’m confused, I believe either there’s more to this than discussed or I missed the point? Granted, perhaps it’s not common knowledge that buybacks help insiders offload their shares at the expense of remaining shareholders. If not for lending purposes, and aside from buybacks (which benefit insiders IMO), why are banks requesting lower capital requirements? The lines have become blurred, FDIC should only be responsible for protecting deposits, not trading losses. FDIC is paid by guess who, (Banks) thus FDIC works in the interest of banks and there should be no doubt that is money well spent. The point was bank capital. The FDIC is worried that Congress will lower bank capital requirements. This will make banks riskier. So this is in the bull’s-eye of what the FDIC (bank regulator) does. Share buybacks lower the capital a bank has. Current capital requirements prevent banks from doing more share buybacks. For banks to do more share buybacks, they need Congress to lower capital requirements. Banks use the excuse that they could lend more if Congress lowered capital requirements. Hoenig calls this BS. He says, banks could lend more under existing capital requirements if they stopped buying back their own shares. Alright, thanks for condensing the verbage. My point is Hoenig is a banking system employee essentially and thus does their bidding, so don’t believe what you hear coming from any of them. We should be the larger picture of privatization of gains and socialization of losses via FDIC, investment risk should be kept separate from deposit capital requirements and there should be no limit for buying back shares with shareholder money (customer deposits should not be used for this). So many people appear to be missing the forest for the trees and the conversation coming from DC (Hoenig, etc.) is (I believe) attempting to confuse the issues. The typical modus-operendi uses baffling by BS and beating around the bush to slip by their version of legislation. Hence the future crash a decade later reveals nothing was resolved. The purpose of FDIC is to ensure customer deposits are protected, not trading losses. Can you see what I’m saying, am I making any sense yet? Get the word out. I see what you’re saying. But I think you misunderstand the FDIC. The FDIC is the nuts-and-bolts regulator of federally chartered banks. It has teeth. It can and does shut banks down. And unlike the Fed (there are three federal bank regulators: the FDIC, the Fed, and the OCC), the FDIC has actually been cracking down on banks. Their auditors basically live inside these banks. The problem is that many times, on big issues, the FDIC is trumped by the Fed. Hoenig is a good example. He very vocally opposed moving derivatives into the deposit-taking units of bank holding companies. The Fed blew him off and allowed it. And that’s what happened. I think we’d be far better off with just one bank regulator (the FDIC) so banks can’t go regulation-shopping. The Fed, mostly owned by the banks, is an effort for the industry to regulate and at the same time promote itself, which is always a sham. Hoenig’s comment had nothing to do with “trading losses.” I’m not sure how you come to this conclusion. I don’t see any connection. But that’s OK.
is that why Goldman Sachs has FDIC? So IOW, Hoenig is gonna dictate what banks are able to do with their profits, they must lend instead of gamble on their own stock? Will FDIC reimburse banks for lending losses? Something’s very fishy concerning these FDIC/Investment bank negotiations. If Hoenig is standing in the way as you seem to believe (which I doubt is the case) his bow will be waxed by the FED, summarily. OK, now I see how you get there. You really need to understand the importance of “regulatory capital” for banks. If you don’t understand this, you will never understand the relationship between banks and regulators – or why the Italian and Spanish banks we have written about so much have collapsed. Capital is at the core of bank regulation. This is the cushion that absorbs losses when assets go bad (mortgages go bad, etc.). It’s the equity capital of a bank. This is NOT cash. In the simplest form: equity = assets minus liabilities. If banks have enough capital, they don’t collapse, and they don’t need to be bailed out, and deposit insurance doesn’t have to be used to protect depositors. Bank capital is the single most important feature in a bank’s stability. This is why regulators such as the FDIC focus on capital (these days, the definitions have gotten complex as to what comprises this regulatory capital). And yes, regulators tell banks all the time to maintain those capital levels. Banks can do this by retaining earnings or by raising new capital (issuing shares) which they HAD to do after the Financial Crisis. Banks on the other hand want to have as little capital as possible. There is a measure, called return on capital. If you have less capital, given the same amount of income, your return on capital is going to be higher. Banks also want to buy back their shares, which lowers capital and makes banks riskier. After the Financial Crisis, the Fed prevented the banks from paying dividends and buying back their shares until they had accumulated more capital. At that time, the Fed and the FDIC agreed: banks were NOT ALLOWED to pay dividends or buy back their shares. This changed in 2015(?) – I can’t remember now exactly when. After the Fed’s stress tests, the Fed allowed the banks to pay dividends and buy back their shares. This was phased in, with some banks being allowed more and others less and some banks none at the time (Citi I believe). But now the Fed has opened the doors all the way. And banks are paying out all their earnings in dividends and share buybacks. And they’re lobbying Congress to lower the existing capital requirements so they can pay out even more for dividends and share buybacks. But lowering capital requirements will make banks more unstable. Hoenig is focused on these capital requirements. He wants them to stay where they are. There is absolutely nothing “fishy” about it. He is one of the few bank regulators who is taking his job seriously, and his job is to make sure banks do everything the need to so they don’t collapse. The entire capital requirements conversation is misleading. Given the repeal of GLASS-STEAGALL, if COMMERCIAL BANKS want to be aggressive and trade like the proverbial hedge fund, then BANKS that are holding companies MUST surrender their FDIC INSURANCE and pay for the use of people’s money. The rich are getting richer, everybody else is getting poorer, and the only people who could do anything about it have either been bribed or marginalized. After you shake hands with a wealthy Banker (the only kind)…count your fingers! Most of those loans would be for small business so they would have a 100% risk weighting. The amount that banks would have to charge their customers to hurdle the cost of capital wouldn’t be worth it. Add in the leverage requirements that the Fed imposes that forces banks to issue more debt the system is broken. The massive amount of lending or spending for 20 years has led to gigantic inefficiencies. Tax money goes to university social science and sports programs instead of infrastructure projects. Even for a small businessman, I’m wondering how did so and so get that loan to build that? They are going to fail within two years of opening on new construction. Every small businessman’s profit margins went downhill after the REITs tookover in the late 1990s. So EVERYTHING in retail, restaurants, and hospitality are overbuilt all across the country a generation later. So the banks lend to their big friends because they can be justified for doing so. The larger the loan, the larger the bonus. My guess is that they can’t really increase lending to mom-and-pop America by *much. * Maybe a little, but not enough to make a difference in the overall economy. Apple hoards a ton of cash. They don’t spend it because it would not be profitable. It would be wasting money like the government. Bastille day is coming. Even drugging the populace with fluoride in the water is not going to stem the tide of violence that is coming. Be Ready, When the SHTF you are going to want to go after your favorite CEO, whether that is the big banks and people like Dimon, oil companies(Chevron, BP et al), or big agro (Hormel et al) look up their addresses now while the net is still up, happy hunting. The super-rich will already have escaped to their underground bunkers or mansions in New Zealand. As absurd as it sounds, there are probably as many people in #1 and #2 afraid this civilization or at least America as a world power is all going down if something doesn’t change soon. I did look at Oath Keeper. What I meant in thinking that gaining the financial sector would be important is….they have to be cynical already and knowing this episode needs to end or will go into chaos. The other option is needing corporate approval…but that’s hard. There are so many industries and I think most of the tech guys might not care because they don’t live in the real world. Trusting the corporate sector too much would lead to fascism. Trusting the banking sector too much would lead to just more of the chaos which no longer works. Jaime Dimon from JP Morgan said on CNBC this afternoon there will be no more share buybacks and they’re looking to acquire other businesses. Many good comments, although may off topic but still interesting/informative. After reviewing the data, it appears the simplest way to further enhance bank stability/solvency, and prevent them from dissipating their earnings, is to significantly increase their capital requirements. This need not require that all earnings go into increased capital requirements, but that significant amounts be used to increase their capital reserves. This is particularly important given the S&P 22,000 stock price level and soaring PE ratios, all of which point to a stock market “correction” which will be unprecedented in living memory, triggering many of the CDS and other derivatives. This has all the earmarks of a Tony Soprano “bust-out” scam, where the assets are stripped, and “management” is part of the scam, leaving the bond holders, creditors, and taxpayers with the bill. “Crazy Eddie” Altair (insanely low prices) went to prison for this.